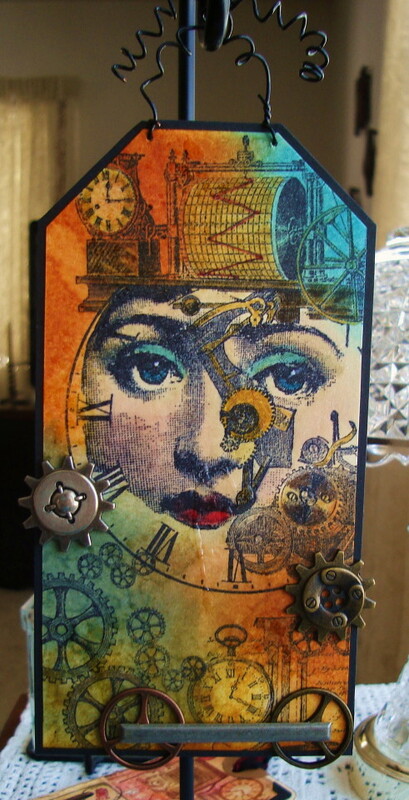 Working with new stamps from “La Blanche”. The Face Tag is called “Measure Her Thoughts. For my self I think she should be named “Gear Head”, fits her life style. Fun bold colors, and piercing eyes. Tag two is “For the Love of Journaling”. set of two and “Well Written”. I used distress markers with this tag and drops of bleach, frayed the edges. Thanks for stopping in this week end. Stunning tags. 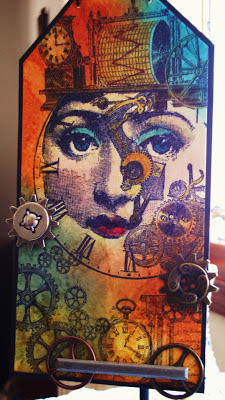 Love all the inking and stamping, the lady with the piercing eyes and vibrant colours being my favourite! Vada, both tags are incredible - love the journaling feel - very tied into a hands-on approach to life and the beauty emerging from our hearts through our finger tips. 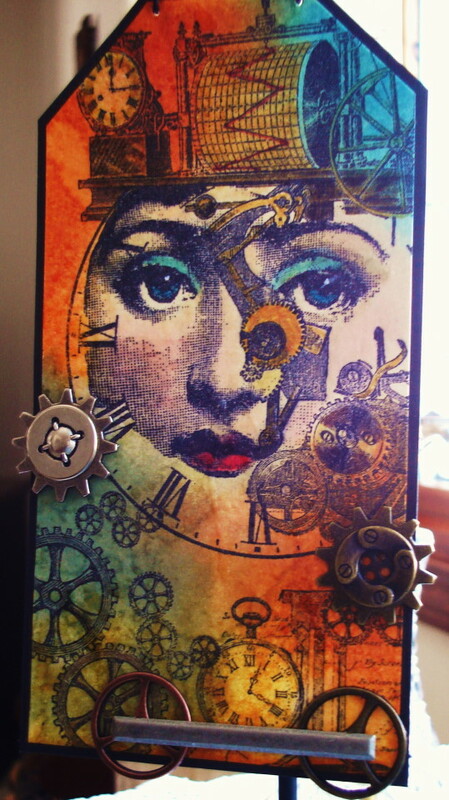 I especially LOVE the woman's face in the clock face, and the pun for gear head LOL great since we women are thinking all the time, and seeing so much out there! The wheels are definitely turning. The colors are amazing! If you produce amazing work like this 'just for fun' then you are one very talented lady; but I knew that anyway. I love this Tag, it inspires me enormously, the design, the colour work, just everything appeals to my senses. This is stunning in my book. Wow there Vada, these are both so artsy fantastic! Love those images and how you combined them, but the inking colors are incredible! She is an adorable gear head! Hope you have a great evening! Hugs! 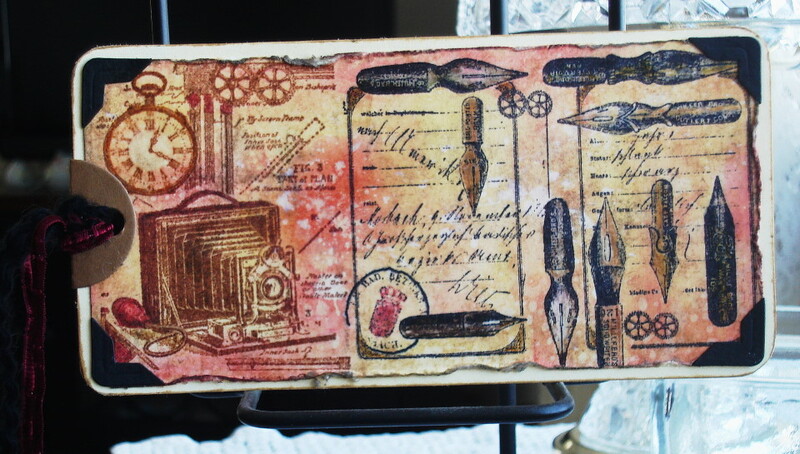 Both of those tags highlight your stamping skills to perfection and the first, your use of colour. Incredible tags. The first is so striking, actually it is compelling and the second, as someone who since childhood, I've loved pens, pencils, notebooks, journals, you can see why this appeals to me. What gorgeous projects, Vada! Love that LaBlanche one with your fabulous coloring.